The soldier wearing a helmet was the first thing that popped out in this image to me. But, if you look again, you can probably spot why this is a multiple meaning illusion. It’s not actually a picture of a soldier’s face. It’s actually a picture of a person bending over creating a soldier illusion. 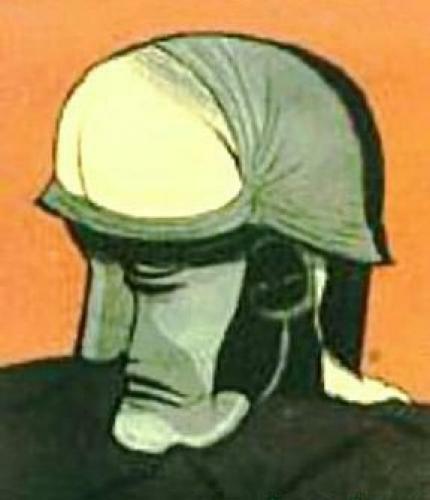 The creases in his pants make the eyes and mouth of the soldier, the arms make the back of the head, and his derriere forms the soldier’s helmet. Pretty cool! Now, before anyone gets all offended, I do not mean any disrespect to our soldiers here! I am about as patriotic as you can get and fully support our troops. I even come from a military family, with my father being a captain in the Army. So, know that I don’t mean any disrespect at all; I just thought it was a pretty nifty illusion. If you liked this soldier illusion, be sure to check out this penguin and president illusion too! Next Can You Find the Farmer’s Wife?